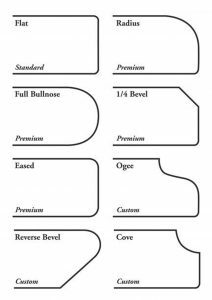 During a countertop replacement or kitchen remodel, your preferred contractor, designer or countertop fabricator should ask your edge profile preference. 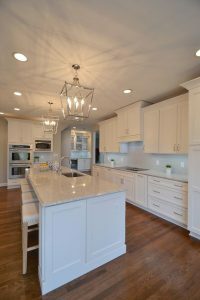 There are several great options – including unique styles and price points for granite, quartz, and solid surface. Familiarize yourself during the planning process so you have a confident answer when it’s time to make that decision! Edge profiles can vary from the smallest detail to the priciest difference. Above are a few common edges that display the name and price category of each. The most common and budget friendly is “flat”. Flat can be beautiful, simple and honestly sway modern or traditional – a great example below by Home Bunch. 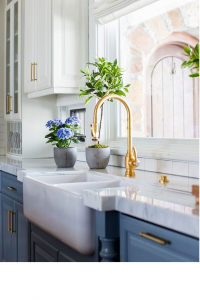 Notice the overall transitional style of the kitchen with colors and finishes, but the thickness and edge really modernize the kitchen’s design. As you may know, The Affordable Companies does a superb job on kitchen and bath remodels. Over the years, they have designed and shared their client reveals with an array of countertop edges. The first image below is an “eased” edge with a soft curve on both the top and bottom of the countertop edge. This style can go modern or traditional. Looking for a more traditional styled edge? 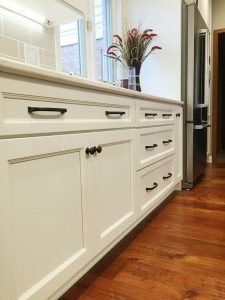 Take a look at this kitchen remodel with an ‘ogee’ edge. I love the upscale and interest this classic edge displays. The ogee compliments the cabinet crown, especially when the cabinets cap before the ceiling height, as this particular project does. Which countertop edge will you choose for your kitchen or bath remodel? Contact a designer at The Affordable Companies to get your project started, visit our website at liveaco.com or call 317.575.9540 today!